Hatters keeper Jonathan Mitchell could scarcely believe his home debut ended in defeat at the weekend. The on-loan Derby County stopper was barely called upon against Crawley Town, with his first touch picking the ball out of the net after 12 minutes when Matt Harrold scored. 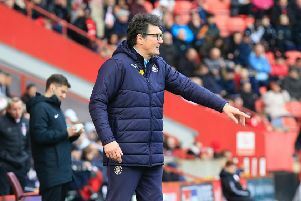 After that, Hatters completely dominated proceedings, denied by the woodwork twice on a frustrating afternoon as Mitchell said: “It was a very one-sided game, a polar opposite to last week (1-0 win at Leyton Orient), but teams will come here and do that. “That’s football though isn’t it. You can be up in the clouds one week and then right back down to earth with a bang. “In some respects it was quite similar to the second half last week. “I know we only had 36 per cent possession last week but we dug in, kept the clean sheet, while this time unfortunately for us we haven’t been able to score. “We’re a possession side, we like to play, but that was an unbelievable game. “It’s so disappointing as I thought we played from box to box brilliantly and were by far the better side, I don’t think anyone will argue with that. The goal when it arrived saw Mitchell have precious little chance of stopping Harrold’s instinctive strike which curled right into the corner. He continued: “I saw it late and it’s gone right into the bottom corner, I don’t think I had much chance with that.